The Model 6064 and 6066 Piezoelectric Accelerometers are excellent general-purpose shock and vibration measurement sensors, where small size and low mass, permits their use on small, lightweight specimens. They are designed for the measurement of wideband, moderate to high-level shock and vibration. The sensors incorporate an inverted shear crystal-mass assembly within a stainless steel body to provide a reliable sensor that is insensitive to environmental inputs such as base bending and thermal transients. The sensor's double-wall, electrically isolated construction provides additional isolation from metallic structures, which aids in acquiring accurate, wideband shock and vibration data uncorrupted by electrical ground loop currents. 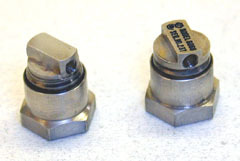 The units are supplied with Columbia's exclusive micro-miniature detachable cable and connector assemblies. High temperature units will operate in environments up to +500 Deg. F.